For the most part lately I’ve been making rustic white and rye breads. 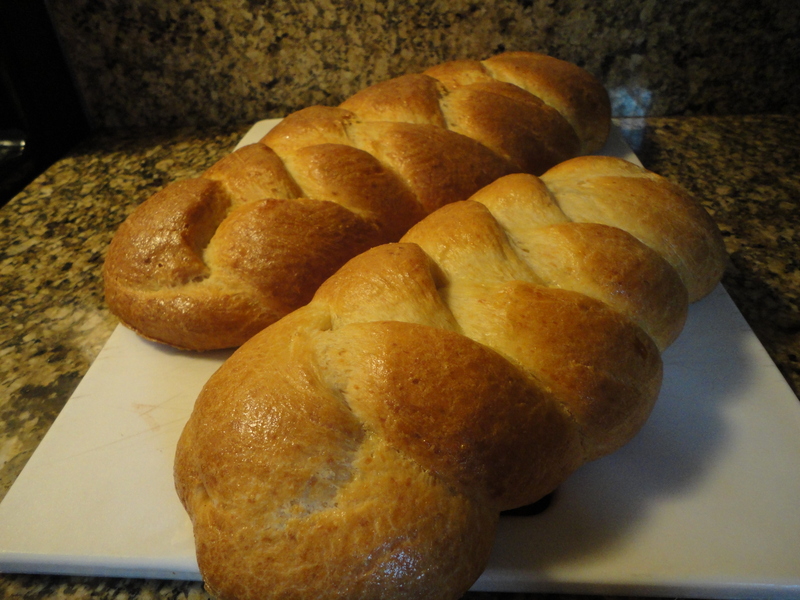 I decided to mix things up and do something different, so I tried my hand at a braided Parmesan Egg Bread. I have to say and I’m pretty darn impressed with myself, lol. The crust is flaky, the bread is light and full of flavor… You need to give this a try. Makes 1 large loaf or 2 small loaves. Add the dry yeast and 1tsp of sugar to the warm water to activate the yeast. Allow to sit in a warm place until the yeast blooms, about 10-15 minutes. In a mixing bowl combine the flour, grated parmesan, salt and sugar. Add the yeast/water mixture and egg yolks. Using a dough hook attachment begin mixing the on a low speed. Once a dough begins to form, about 2-3 minutes, slowly add the olive oil. Increase the speed to medium and continue to mix for an additional 3-5 minutes, the dough will be slightly tacky. Place the dough in a large bowl and coat it thoroughly with olive oil. Cover with plastic wrap and a towel and set the bowl in a warm, draft free place until the dough doubles in size, approximately 1 hour. Turn the dough back out onto the floured surface and lightly knead it. Return the dough to the oiled bowl, cover, and allow to rise again, approximately 25-30 minutes. Turn the dough back out onto the floured surface and very lightly knead it to release much of the air. Cut the dough into three equal pieces (six if you’re doing two small loaves). Roll the three pieces into ropes, roughly 1″ thick. Lay the ropes parallel to one another and braid them, tucking the ends under once braided. Lay the braid on a baking sheet lined with parchment paper and cover with a towel, once again set in a warm, draft free place, allow to rise for another 25-30 minutes. Beat together the egg and olive oil and lightly brush the braid with the mixture. Bake for 30-35 minutes, until the outside is a golden brown and the loaf makes a slightly hollow sound when tapped. Allow to cool at room temperature for at least 5 minutes before cutting. Tags: braided bread, bread, cheese, egg bread, homemade, parmesan egg bread, perfect pairings, perfect pairings at home. Bookmark the permalink.